Real santa is evil? Naahh...it's a joke. Christmas just around the corner and it's the most joyful time for Christians people around the world. As for me, i'm a Muslim but grew up in very unique surrounding. The families from my mother-side mostly Christian and from my father side, mostly Muslim (some of our relatives back in Philippines are also Christian). As i grow up.. i was really enjoyed reading a story books especially sci-fi, love stories and fairy tales. 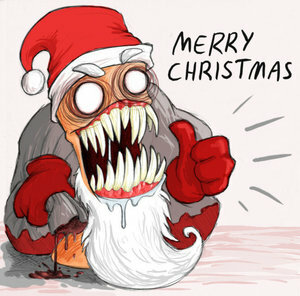 One of the most favourite fairy tale is all about Santa Claus. I know it just a fairy tale and people with more than 150kg weight can't ride a deers and fly up to the sky.Do you know the real Santa actually exist? His real name actually Saint Nicholas and he's from Turkey. "Demre, Turkey (CNN) -- The hometown of the man who inspired the legend of Santa Claus is a long way from the snow and arctic lights of the North Pole. The land Saint Nicholas is originally from rarely sees snowflakes -- it is a village of palm trees and orange groves on the Mediterranean Sea in what is modern-day Turkey. Nicholas, patron saint of sailors and children, lived and died there nearly 18 centuries ago. The legend of the 4th century bishop who gave gifts to the poor has spread since the earliest days of Christianity. Eventually, Saint Nicholas evolved from the bald and bearded man depicted in Orthodox icons -- dressed in long robes and clutching a bible -- to the more rotund and secular character of jolly old Saint Nick. Though Santa Claus is today inextricably intertwined with Christmas, hardly any of the residents of Saint Nicholas' hometown celebrate the holiday. Demre is an overwhelmingly Muslim town where the call to prayer periodically echoes from minarets over the sun-bleached stones of chapels and a sprawling Roman amphitheater that was constructed long before the days of Saint Nicholas. "Nobody celebrates Christmas here. It's interesting," said Baris Yuksel, speaking in his shop amid a sea of gold-framed icons of Saint Nicholas -- a man locals know here as "Noel Baba," or Father Christmas. Like many other residents of Demre, Yuksel grows and exports tomatoes from some of the many greenhouses that surround this small community. But in recent years he has also made a lucrative business selling images of Demre's most famous son to the hundreds of thousands foreign tourists who visit the Church of Saint Nicholas every year. "We are so happy with Saint Nicholas," Yuksel said. "After lots of centuries we are earning money thanks to Saint Nicholas." 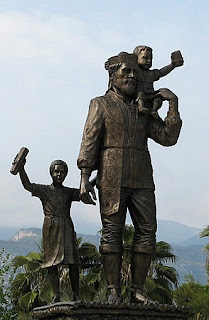 Demre's gratitude is evident in the town's official logo -- which features the familiar bearded face of Santa Claus -- and a bronze statue of a slimmer Saint Nicholas holding hands with two smiling children, which overlooks the central town square. The man behind the legend is believed to have died in Demre in 343 AD, when the city was then known as Myra and many of the inhabitants spoke ancient Greek. "Nicholas is a real man. He lived here and he died here, and he talked about Christianity in a widespread area," said Nevzat Cevik, a Turkish archaeologist unearthing history about one of the world's earliest Christian civilizations. Cevik said Nicholas of Myra was a Christian bishop, who is depicted in ancient engravings chopping down a tree that symbolizes the region's earlier pagan Roman religion. "He destroyed pagan temples also," Cevik said, referring to the Temple of Artemis, which is believed to have been razed to the ground on Nicholas' order. "They destroyed the pagan buildings ... and then they used the materials of those buildings to build their churches." As evidence, Cevik points to a 12th century Byzantine chapel his team recently discovered buried next to the house of an elderly Turkish man named Ahmet Gezer, whose bushy white beard was surprisingly Santa shaped. Part of the floor of the chapel is constructed out of stones pillaged from the sarcophagi of earlier pagans. After his death, Saint Nicholas was honored as a martyr. Cevik argues that his legend began to grow after it was retold by another Christian priest named Nicholas of Sion, who lived in the area more than 100 years after Saint Nicholas' death. Cevik theorizes that Christian believers began combining the stories of the two men named Nicholas. "After the 6th century AD, there are 2 Nicholases in one figure," Cevik said. "They come together and we know only one Saint Nicholas." In subsequent centuries, the tomb of Saint Nicholas became a place of pilgrimage for Christians traveling from around the Mediterranean Sea. Gradually, other European cultures adopted the popular saint, and added their own twists to his image. The Santa Claus we see today appears to have evolved out of a Scandinavian version of the saint, who was later popularized by 19th century American writers and U.S. companies like Coca Cola, which used Santa's image to promote their products. The mayor of Demre is a big fan of this contemporary Santa Claus, which some Turks refer to as the "Coca Cola Santa." "Indeed, he is something that the Americans invented," said Mayor Suleyman Topcu, "[but] he is nice and colorful." Topcu said he planned to put a big red Santa statue up overlooking the new street and beach he recently named after Father Christmas. But some of Demre's younger residents want to set the record straight on their town's most famous son. "He didn't have magic powers or flying reindeer. That's only in the cartoons," said 10-year old Habip Erdogan. His friend, Batuhan Katilimis, also 10, said: "He was a good man who gave gifts." No matter what version you believe in, everyone in Demre seems to agree -- it is the spirit of Saint Nicholas giving to those who are in need that is the legendary man's most enduring legacy." Don't you think that isn't it Claus or Klaus a german name? I had one of these crazy idea the origin members of Scorpions (German rock band). 2 members in a band, Klaus Meine and Rudolph Schenker. I always told the kids about it as a joke. When santa retire from sending gifts and presents, he just completely bored and started sing in a rock band so called Scorpions and appointed Rudolf Schenker his beloved deer and used his magic transformed him into human just to replace Michael Schenker at that time. To make it sounds more "human", he just added Schenker as a surname for Rudolf. Sounds logic for the kids, right? Try it and they may not asking about the presents from santa again. I also said that "santa" now using his magic on his voice to passionate peoples around the world through his songs. I think i also agree with one comment from the reader at the CNN website, i quote;"CNN should also have checked out the Dutch Sint Nicolaas or "Sinterklaas" which probably let to the US Santa version. This Dutch tradition was brought to the United States in the Dutch colony/city of New Amsterdam which is now called New York. This Dutch tradition is far more popular in the Netherlands then Santa and involved a man with similar looking cloths and appearances to the US Santa."